Total sales amounted to R13 223 200 at the 33rd Nedbank Cape Winemakers Guild Auction held yesterday, 2 962 cases (6 x 750ml equivalent) sold at an average price of R4 464 per case and an average price per bottle of R744. This compares to last year’s record sales of R13 833 200 for 2 428 cases, average price per case being R5 697 (average price per bottle: R950). 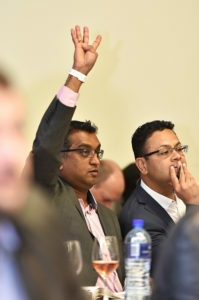 79% of the wines were bought by local buyers and Tsogo Sun was the biggest buyer for the fourth consecutive year with total purchases of almost R1.7 million (the hotel group did not participate at the recent Nederburg Auction). Danie Steytler’s Kaapzicht The Ultimate Vision 2015 fetched the highest price ever recorded of R16 600 for a 6-bottle case, his last auction wine before he retires as a producing member of the Guild. The other most sought-after wines based on an average price per case equivalent of 6 x 750ml were Boekenhoutskloof Syrah Auction Reserve 2015 (R12 000), Leeu Passant Old Vines Cinsault 2015 (R10 400), and Beyerskloof CWG Traildust Pinotage 2015 as well as Kanonkop CWG Paul Sauer 2014 (R9 000). For summary of prices realised per item, download the following: 2017 Nedbank CWG Auction – Summary of Prices Realised per Item. Thanks Christian. Is the full sales list available? Hi Abrie, Summary of prices now uploaded.